Resist is used to draw the outline of an image on silk. Removable Water-based Resist is a superior resist that easily washes out with warm water (even after steaming or setting), revealing the white or colored silk beneath. Removable Resist keeps the silk completely soft to the touch and allows artists to create layered designs, as in batik. It holds a crisp line without spreading and does not shrink or pucker when dry. 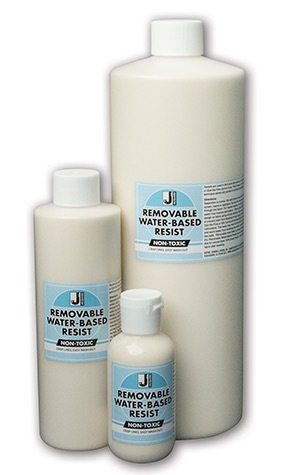 Removable Resist may be tinted with any water-based dye for colored lines and is screenable, odorless, alcohol-free and non-toxic.